If you’ve been following me on Instagram, you’ve probably noticed that I’ve been talking about how busy I’ve been lately. Among many other things, my fiancé and I are headed to Alaska for 8 days at the end of the month and my number one goal is to be as cut off as possible. Actually, even if I wanted to be “plugged in,” that’s not exactly something I’m expecting in Alaska! We’re actually renting an RV and staying in a number of parks without any sort of electricity or running water. Two RV-newbies, off the grid, in the middle of Denali National Park. Adventure doesn’t even begin to cover what I expect from this trip. In the few and far between moments that I do have internet access, I’ll be posting all of the sites & eats we come across on Instagram so be sure to keep your eyes peeled! In the meantime, there’s a whole lot that needs to get done. Cooking elaborate meals is not something I’ve really had time for and I’ve been gravitating toward easy dishes that are predominantly hands off. Which leads me to… (and okay, that pun may have been totally intended), Jennifer Robins of Predominantly Paleo and her new cookbook Down South Paleo! In the midst of feeling like I’ve been working nonstop without any extra time to spend in the kitchen, Jennifer’s book showed up at my doorstep just in time. This book made my mouth water within 30 seconds of opening it. SO many amazing recipes caught my eye. 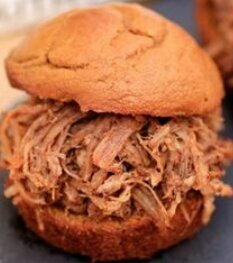 I decided to make the Sweet & Savory Slow Cooker Pulled Pork (recipe below), Slow Cooker Rotisserie Chicken and Taqueria Breakfast Burrito right off the bat. Between the grain-free biscuits and gravy, mini chicken pot pies, fried chicken and key lime pie… I have no idea how to choose which dish to make next. Everything looks and sounds so amazing. In addition to the killer recipes in this book, Steph Gaudreau from Stupid Easy Paleo has done a tremendous job on the photography. As a fellow self-taught photographer, she’s always been someone who I’ve looked up to. I have a lot to learn but I’d love to shoot the photos for my own cookbook someday! Jennifer, for those of you that don’t know, also co-wrote The Yiddish Kitchen ebook with Simone Miller, which will soon be released as a printed book. If you’re looking for paleo-friendly versions of some classic Yiddish dishes, this soon-to-be cookbook is the best there is. (The bagels are to die for). Given the amazing recipes in the Yiddish Kitchen, I wasn’t super surprised at how delicious and simple the Down South Paleo recipes were. I decided on the Taqueria Breakfast Burrito mostly because I can’t get enough of Otto’s Cassava Flour. Down South Paleo has quite a few recipes that involve fresh Yuca (also known as Cassava). It’s quite an impressive ingredient and works amazingly well as a wheat flour alternative. Being as busy as I’ve been, I decided to opt for making my tortillas with Otto’s pre-made yuca flour instead but followed the rest of the recipe exactly. Okay, so maybe not exactly… I also added a some of the Primal Palate Adobo Seasoning because I’ve been adding that to literally everything lately and it was a perfect fit for this dish. I also made the homemade salsa to top it off. The results? A-mazing. We gobbled these up so quickly. The Slow Cooker Rotisserie Chicken grabbed my eye for two reasons. First, I had a chicken ready to defrost in my freezer and the recipe looked like it would take no time at all. When I say no time, I really mean no time. Throw the chicken into your slow cooker or Instant Pot with some veggies and spices, close the lid, come back in 4 hours and… voila! Dinner is served. The flavors were so pronounced and chicken was ever so juicy. Tonight we’ll be using the leftover broth, veggies and chicken to make a quick stew. I think we’ll throw in some kale too! 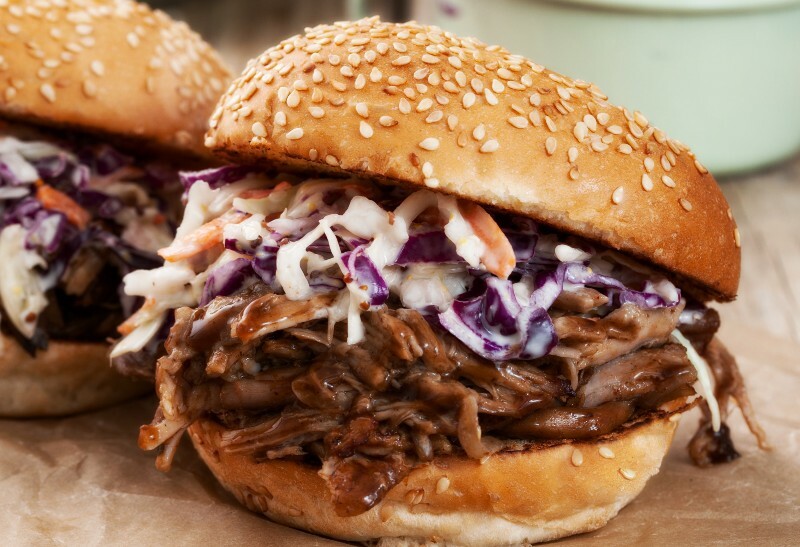 Last but certainly not least, the Sweet + Savory Pulled Pork recipe, which Jennifer has given me permission to share with you guys! 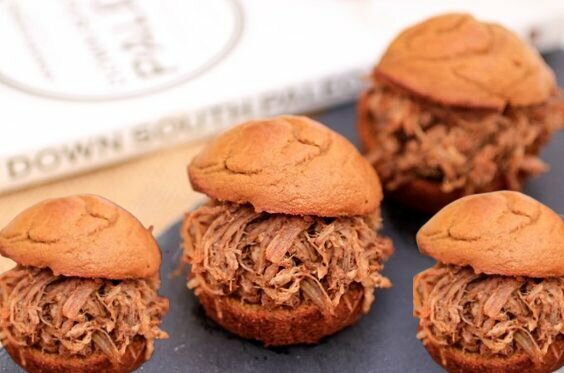 I am a huge, huge fan of pulled pork. Really, any kind of slow cooked or barbecued meat is high up there on my list of favorite foods. 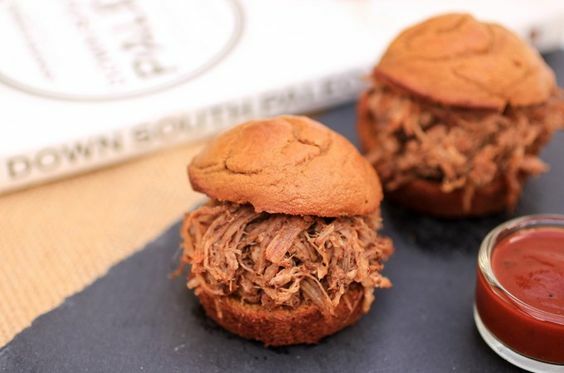 I have one go-to pulled pork recipe that I promise to share with you guys soon but I was more than happy to mix it up a little bit with the Down South Paleo version this week. 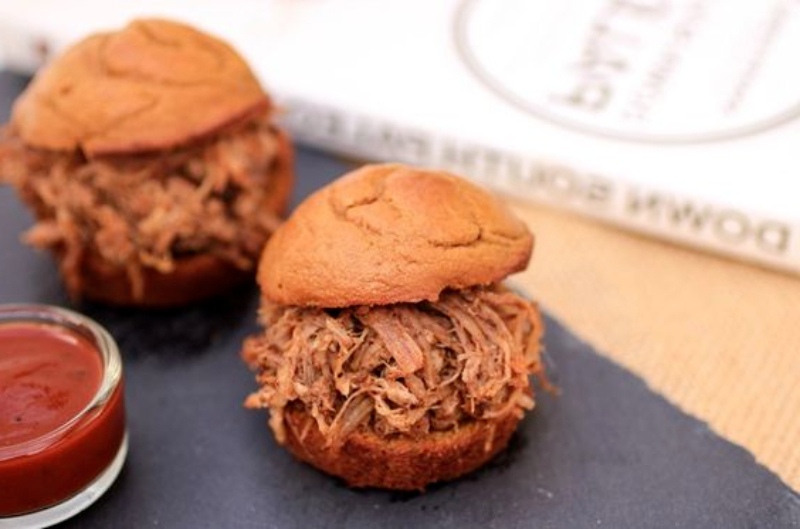 As flavorful and juicy as the pork was, the Sweet Potato Slider Buns stole the show. I had never, ever cooked with sweet potato flour before and I can’t wait to use it constantly. 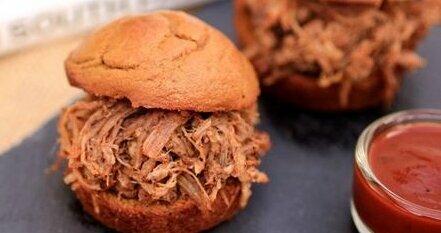 These little buns were so perfect paired with the pork and had the perfect amount of sweetness. Even my fiancé, who never seems to be pleased with my grain-free bread options, was completely obsessed. I can’t wait to make these again and again. This recipe is from Down South Paleo by Jennifer Robins, shared with permission. Place the pork loin in the bottom of the slow cooker or Instant Pot. Place the onion rings around the pork. Sprinkle all the seasonings on top of the pork, saving the apple cider vinegar and honey for last. Once the pork has been seasoned, pour the vinegar on top of the pork and then drizzle the honey over the seasonings. Cook on high for about 4 hours, or until the meat shreds easily with a fork and knife. Don’t forget to order Down South Paleo for all of these recipes & more – it’s released August 11th and is only $10 on Amazon right now. Serious bargain if you ask me! This looks absolutely amazing!!!!! 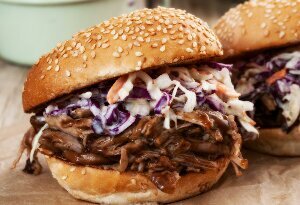 Pulled pork is a definite yessssss especially if you can throw it in a slow cooker and then forget about it!